No matter if you’re a tennis fan or not, it’s sad to see a superstar athlete like Andy Murray forced into early retirement due to injury (Fig. 1). On Friday, an emotional Murray admitted that his time as a tennis professional is nearly up due to osteoarthritic hip pain. Scottish born Murray has been one of the 4 best men’s tennis players this decade and has frequently challenged the ‘Big 3’ (Roger Federer, Rafael Nadal and Novak Djokovic) for the biggest titles in the sport. Although some are optimistic about the future of stem cell therapy, Murray’s orthopedic surgeon, the legendary Dr. John O’Donnell, believes his only hope for relieving the sharp groin pain is hip resurfacing or a total replacement. “It’s like the brake linings of your car, if you rag them too hard, they wear out earlier; particularly if the hip has suffered previous injury.” In Murray’s case, his degenerative joint disease resulted in a damaged humeral head, loss of joint space, and osteophyte formation. 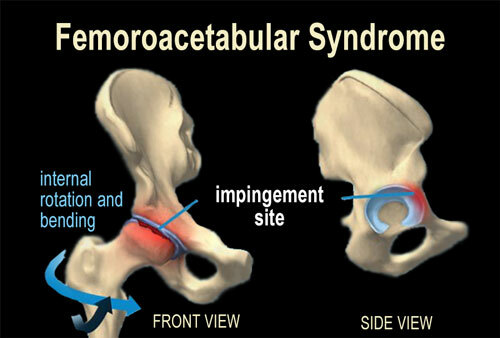 Over time, the repetitive grinding of the femur on the rim of the acetabulum has also caused femoroacetabular impingement syndrome (FAI) and accompanying labral damage (Fig. 2). Although Dr. O’Donnell diagnosed Murray with hip osteoarthritis, I will be referring to the condition as osteoarthrosis (OA) since there is little solid research confirming an inflammatory process in cases of “wear-and-tear” degenerative joint disease. Let’s look at the two types of osteoarthrosis: primary and secondary. In primary OA the initiating factor is unknown yet it’s commonly seen in weight-bearing joints of women in their 50’s and 60’s. Conversely, in secondary OA, the factor or event is known. For example, in Andy Murray’s case, repetitive movements, recurring injuries, abnormal joint movements, and excessive femoroacetabular loading during his teenage growth spurts are suspected causes. According to research conducted by Abbott et al, a number of manual therapy modalities has been shown to be successful in treating subjects with mild to moderate hip OA.1 These include soft tissue and stretching techniques, articulation maneuvers, and manipulation. Given the close kinetic link between the hips, lumbar spine, sacroiliac, and peripheral joints, it’s best to approach osteoarthrosis from a global viewpoint… that’s one of the goals of Myoskeletal Alignment Techniques (MAT). When clients present with reactive muscle guarding in combination with painful femoroacetabular joint restriction, I’ve found greater success by combining MAT with a specifically applied exercise program such as Paul Kelly’s new PhysioKinetix Training (PKT). I believe that MAT is a great preparation for exercise therapy due to its effect on pain modulation, joint limitations, and muscle hypertonicity. Because MAT techniques use graded exposure stretching and gently articular mobilization to optimize joint lubrication and reduce neuromuscular tone, it’s the perfect combo for those suffering mild to moderate hip osteoarthrosis. Here’s an example of a simple, but effective femoroacetabular MAT routine for clients presenting with his osteoarthrosis pain and/or limited functional mobility. 1. J.H. Abbott, M.C. Robertson, C. Chapple, D. Pinto, A.A. Wright, S. Leon de la Barra,et al.Manual therapy, exercise therapy, or both, in addition to usual care, for osteoarthritis of the hip or knee: a randomized controlled trial. Is Balance the Key to Ideal Posture? How did it get so big?